The seas cover 71% of the earth's surface, 65% is open ocean - an immense ecosystem if you just consider the surface. The vertical extent of the open oceans, however gives this ecosystem a third dimension. The oceans have a maximum vertical extent of almost 11km and about 80% of the oceans is deeper than 1000m - an immense area. We divide the oceanic environment into several main realms or zones. The epipelagic realm (from the surface to 200m) marks the limit of the photic zone, where daylight is adequate for photosynthesis. In the mesopelagic realm (from 200 to 1000m) light from the surface, though very dim, is still visible, if the water is clear. The bathypelagic (from 1000 to 6000m) includes the abyssal plains but excludes deep trenches (the hadal realm). 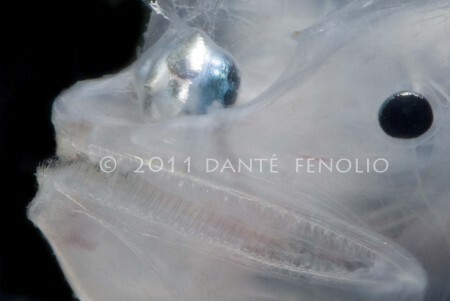 Deep sea fish are the species of fish that live in the mesopelagic, below the photic zone of the ocean. The conditions here are extreme. The water is cold - it has a constant temperature of only 2 degrees Celsius, there is little difference between day and night and the pressure is enormous. Animals living here have developed many strategies to cope with that. Because these fish live in a region with little or no natural illumination, they cannot solely rely on their eyesight for locating prey or their mates. Instead many deep sea fish are luminous, others have extremely large dark-adapted eyes or long feelers to help them locate prey in the dark of the deep ocean. Some animals don't have functioning eyes anymore but have developed special organs that can "see" infrared, so they can sense body heat. Some of the most interesting fishes living in the deep ocean (mesopelagic and bathypelagic realm) are the deep-sea anglerfishes. 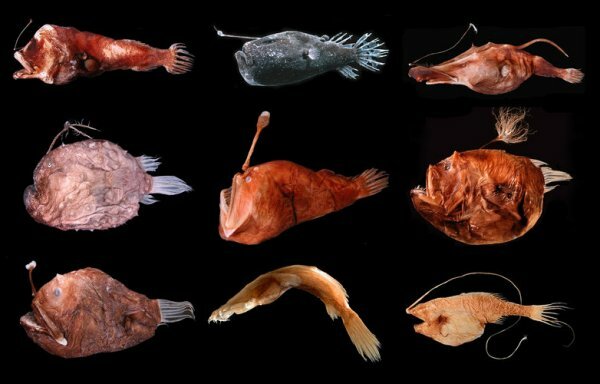 Eleven families of the order Lophiiformes (anglerfishes) live in the deep sea, with nearly a hundred species, more than any other group of bathypelagic fishes. Suborder of Ogcocephalioidei: Caulophrynidae (Fanfins), Centrophrynidae (deep-sea anglerfishes), Ceratiidae (Seadevils), Diceratiidae (Double anglers), Gigantactinidae (Whipnose anglers), Himantolophidae (Footballfishes), Linophrynidae (Leftvents), Melanocetidae (Black seadevils), Neoceratiidae (Toothed seadevils), Oneirodidae (Dreamers) and Thaumatichthyidae (Wolftrap anglers). There are two more families of anglerfishes which live in deep waters, Chaunacidae (Sea toads) and Lophiidae (Goosefishes). A third family, Ogcocephalidae (Batfishes) lives mostly in shallow water but can also be found in deep water. In contrast species of the family Antennariidae (frogfishes) live mostly in shallow water, close to coral reefs. Female deep sea anglerfishes have a globular shape, not adapted for sustained rapid swimming, but designed for remaining motionless much of the time. 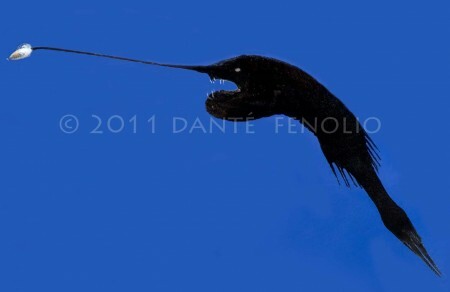 Only Gigantactinidae (whipnose anglers) have an elongate form that is suitable for brief bursts of swimming. Unlike the colorful frogfishes that live in coral reefs, deep-sea anglerfish skin is grimy black or gray and fragile, without scales. In fact, their skin is so thin it can slip off their bodies when touched by human hands retrieving them from deep-ocean nets! They have flabby muscles and weak skeletons. Gill slits are very small, C-shaped and placed below the pectorals and a little behind them. Himantolophidae (Footballfishes) with a globular shape ideal for hovering motionless. Himantolophus groenlandicus (left) has a whip shaped lure, Himantolophus mauli (right) has a forked lure. Gigantactis macronema (Family Gigantactinidae or Whipnose anglers) with a more elongate body and a long whip-like lure attached to the tip of the snout. In some cases the lure can be four or five times longer than the fish itself. 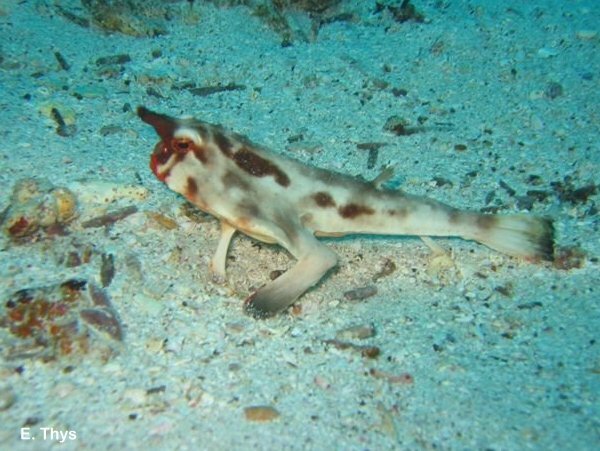 Cryptopasaras couesi (triplewart sea devil) belongs to the family of Ceratiidae. The female has three luminescent sacs, called caruncles (A), in front of her dorsal fin. These are a pair of low, fleshy appendages and have been interpreted as vestiges of the first dorsal fin, for each of them encloses a spine that can be felt if not seen. Their exact function is not known, presumably they also aid in enticing prey to within striking distance. The female seadevils are the largest deepsea anglerfishes, reaching up to one and a half meters and then weighting around 10 kg, compared with them the males are dwarfs, weighting only about 150 grams. Chaenophryne melanorhabdus of the family Oneirodidae (Dreamers) with its illicium (lure) which is sharply bent and can be positioned directly in front of the mouth. 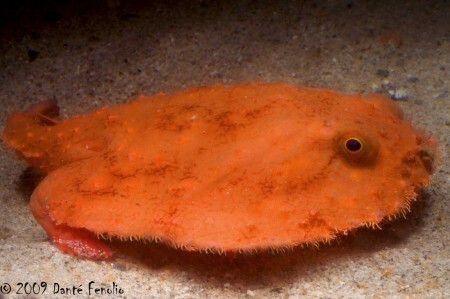 These anglerfishes that live on the bottom (benthic) still have fins that look like legs, similar to the frogfishes. 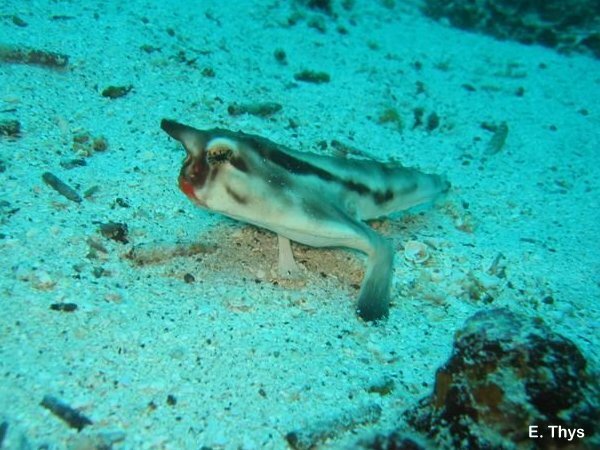 Look at this website for more information about batfishes. In open water food is much more reliably available than in the deep ocean where meals are rare and unpredictable. Animals livingin the seed sea have developed strategies to find food and ways to eat whatever food there may be with as little effort as possible. In deeper waters of the ocean there are a lot of animals, which prefer to await for the arrival of prey or food particles rather than to search them out actively. Many animals are not very selective in their diet and they can cope with amazing large prey. Female anglerfishes are classic lurk-and-lure predators. They have a large mouth and their teeth are huge compared to their body size. Instead of searching actively for prey, they wave a luminous lure to attract them. They can cope with very large prey, because their expandable jaws open double wide and they posses an elastic stomach and they eat any prey available. But their most amazing feature is a bioluminescent lure. 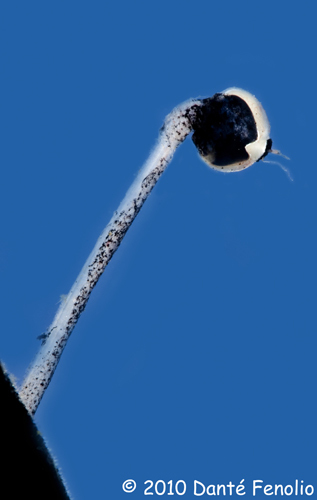 Phyllorhinichthys micractis (Oneirodidae - Dreamers) with lure and esca which has hair shaped appendices and a long pipe with a lens at the tip. There is a bulb like light organ (A) containing a gland with luminous bacteria. 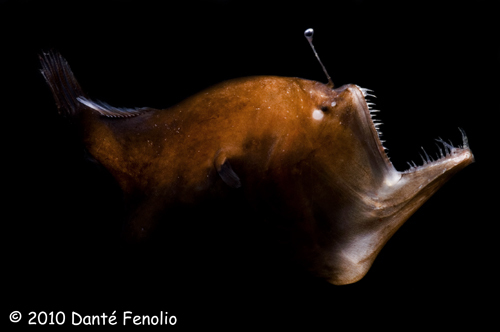 The lures of the female deep sea anglerfish (male anglerfish have no luminous organs) is much more elaborate than the lure of the shallow water species and in addition bioluminescence is used to attract the prey in the dark. The lures are modified dorsal fins and contain luminous bacteria which produce a bluish, greenish light. The light and movement of the lure attract the prey to within reach of the gaping jaws. 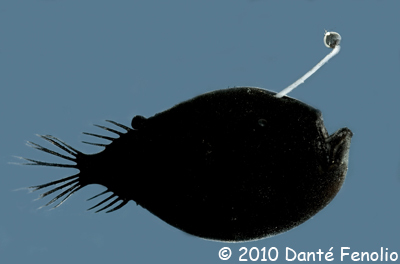 The anglerfish Cryptopsaras can slide the rod part of the apparatus back into a groove, drawing the lure and prey closer to the mouth. It can rotate the lure tip and produce a flash from it as well as a glow. All this is controlled by enzymes and the contraction of chromatophores. The lures of deep sea anglerfishes are extraordinary elaborate, with sensory filaments, papillae, light pipes and shutters. It may be, that different species mimic different kinds of small prey like shrimps to attract larger prey. 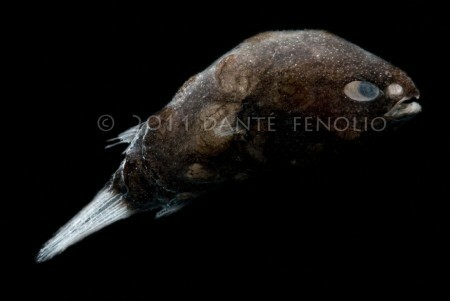 One anglerfish (Caulophryne) has a lure ornamented with many filaments but it is not luminous. An other (Linophryne) has not only a luminous lure on the head but also a multibranched barbel hanging from the lower jay. The barbel filaments contain many more bioluminescent organs. Linophrynidae (Leftvents) with lure and barbels. The Latin name literally means "toad that fishes with a net". Linophryne algibarbata (left) and Linophryne arborifera (right). 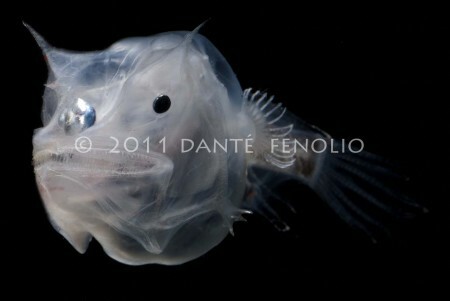 The lure on this anglerfish has a short rod attaching it to the fish, so the glowing bulb sits on the face of the fish. 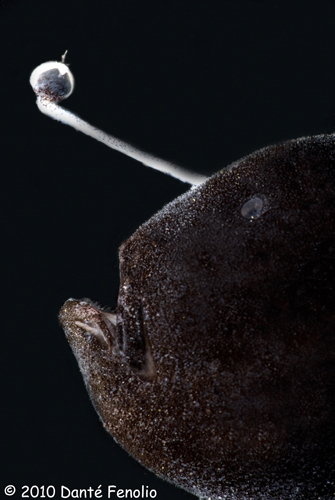 Some deep sea anglerfish have positioned their lure inside the mouth. The wolftrapangler Thaumatichthys axeli is a sit-and-wait ambush predator with a luminescent lure hanging from the roof of his overshot mouth, which is fringed with hooked sharp teeth. This anglerfish hovers just above the substrate (not sitting on it). 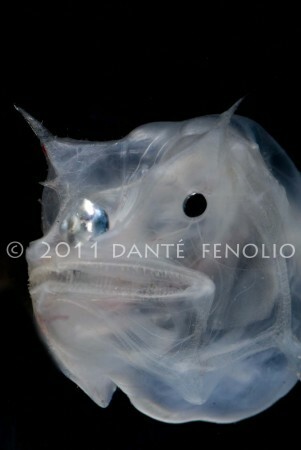 Some deep sea anglerfishes have so called neuromast structures or organs formed by groups of hair cells. 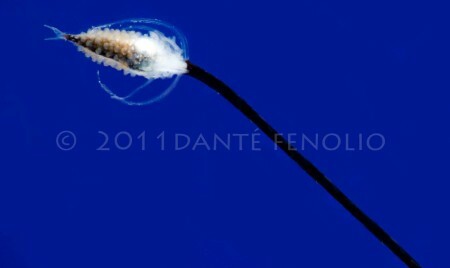 The structures look like antennae or thick hair and sit on the trunk or are mounted on long stalks or fin rays. With these freestanding structures they can sense the "noise" engendered by a fish's movement. While floating neutrally buoyant in the water, the anglerfish can probably sense the direction and the velocity of approaching prey. Caulophryne polynema of the family Caulophrynidae (Fanfins) relies solely on its superficial sensory neuromast structures to find prey and doesn't have a luminous lure. It also has soft skin and a highly expandable stomach. With such small numbers of animals spread very thinly over an enormous are, it can be difficult to find a mate. Deep sea anglerfish males reach sexual maturity soon after metamorphosis (change from larval stage to adult) but females take much longer. One estimates that there are 15 to 30 ripe males to every female anglerfish, probably it is very difficult for anglerfishes to find a partner in the deep sea. In most species the males may attach briefly during mating but the deep-sea anglerfish (Families Ceratiidae, Caulophrynidae, Photocorynidae, Linophrynidae and Melanocetidae) shows a very strange sexual dimorphism (differences between males and females). 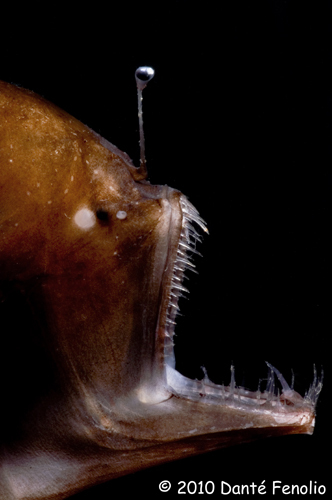 In most species the female deep sea anglerfish is much larger than the male anglerfish, actually they are real dwarfs compared with their mate. For example the largest females of the genus Gigantactis grow to 40cm in length, whereas the largest males only grow to 2cm. Unlike their sluggish partners they have muscular bodies for active swimming. For many years fish biologists were very confused by these differences and misidentified male and female anglers as completely different species. When they are born, male anglerfishes have no other role than to search out a female. The male has no bioluminescent lure, probably they never even feed. Instead they have larger eyes, presumably for spotting the females flashing lure and a much larger olfactory organ in front of their eyes. This difference in size is probably, because in deep sea sexual pheromones are very important in mate location. Since mature males of anglerfishes greatly outnumber mature females, so heightened sensitivity to female pheromones is an advantage. After locating a female anglerfish, the small male attaches himself to her body by biting into her belly. His teeth and the jaw recedes, the skin fuses and the blood systems of both animals merge. Effectively the male becomes parasitic and doesn't have to find food by himself anymore, actually the intestine regresses, since it is not used anymore. In fact, about the only important internal organ is a large testis. The female has a guaranteed supply of sperms and the male is taken care of the rest of his life. Presumably the female anglerfish even controls the delivery of sperms with her hormones so it is coordinated with the moment she ejects her eggs from the body. Once fertilized the eggs which contain large oil droplets to give them buoyancy float to the surface of the ocean. Neoceratiidae (Toothed seadevils) with attached male anglerfish. Females may occasionally even have more than one attached male. Details of the male anglerfish attached to female by two outgrowths from the front of the head, that are fused at the tip. The best way to avoid being eaten is to avoid being seen or sensed. Deep sea anglerfishes usually are of dark color and remain floating nearly motionless while sensing approaching prey and also avoiding being noticed by other predators. It is not known if they have other defense mechanisms such as venom. Bioluminescence can also serve as a decoy, for example the luminescent barbels of the Linophrynidae (Leftvents) hanging beneath the body might confuse possible predators. Fishbase has the largest collection of photos of deep sea anglerfishes - look at the taxonomy page and click on the link next to the species names. The Australian Museum has a website with several photos and a good description and some close-ups of the lure, esca and caruncles. Search by Latin name. 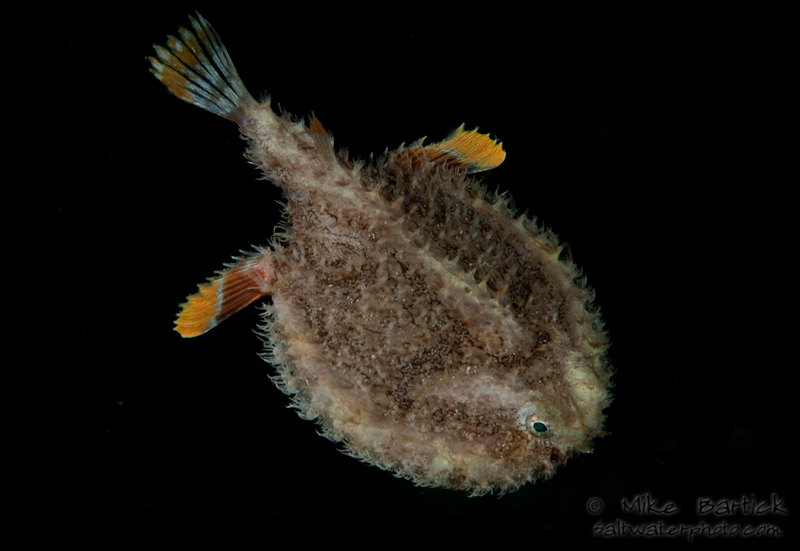 NOVA has a page about deepsea anglerfishes with some nice photos of living anglerfishes taken underwater. An interesting video of a strange looking deepwater frogfish (Lophiodes fimbriatus), found in shallow water in Alor, Indonesia. Google image search works quite well, if you search for the Latin names. Some really interesting black-and-white photos and illustrations I have found on Tierlexikon, a German page. Even if you don't understand the text, just hover with your cursor over the text that says "(Abbildung ...)" and a small photo is visible. Then click on the underlined word to see a larger photo.